The global positioning system (GPS) enables fleet management professionals to track their vehicles and enhance the value of their assets, reduce costs and improve productivity. There are many ways, in which GPS fleet services benefit commercial vehicle operators. These include routing, fuel efficiency, reduced maintenance costs, and higher safety and security, among others. It helps to know exactly where your fleet is at all times to get the most efficient use out of the vehicles. Issues like whether there is heavy traffic are also crucial. Exact location tracking gives your fleet more flexibility — it can serve unplanned requests from customers, locating the nearest vehicle for response in the shortest possible period of time. More efficient routing decreases fuel consumption by avoiding heavy traffic and shortening distances. The capability to change routes based on real-time information, weather, and traffic patterns can reduce maintenance costs by limiting exposure to conditions that promote excessive amortization. This can extend the useful life of the fleet and the time between service intervals. By means of GPS fleet tracking, you can collect data such as speeding, rapid acceleration, harsh braking, and sudden cornering. This information can be used to assess driver performance, lower the risk of accidents and help drivers maintain good practices. InTouch GPS is a great fleet tracking company with top quality software, especially for small businesses. It is inexpensive, features free hardware, and you don’t have to sign a long-term contract or have a minimum number of vehicles in your fleet. InTouch do not charge any installation or maintenance fees. There are no hidden costs, and the price includes phone support. Their software has one of the easiest user interfaces you can imagine, with a clearly comprehensible menu system. Installing their device is also easy. You can use plug-and-play hardware – all you need to do is plug it into a port in the vehicles you want to track. It connects to the software automatically and starts transmitting data almost immediately. InTouch’s GPS software features 24/7 tracking, location and dispatching, Google Maps integration, and customized alerts. You can watch your fleet around the clock. The company gives you access to live view of vehicles and vehicle data at all times, so you always know where your fleet is. It is easy to find and contact vehicles from your dashboard – just enter an address and you can locate the nearest vehicle available to take an order. This feature also helps you inform drivers of any urgent changes. Using the customized alerts, you can monitor your fleets even when the software isn’t being used. InTouch GPS lets you set up custom text and email alerts for a vast number of events, so you’ll always know what’s going on. These include bad driver behavior, such as excessive idling, speeding, and going off-route, maintenance reminders at specific dates or mileage, geofencing and landmark notifications, driver arrivals and departures, beginnings and ends of shifts, when reports are created and sent and more. When you enter a vehicle’s end point in the “Destinations” category, the company will automatically update ETAs until the vehicle arrives. Using the mobile app, you can track your fleet and drivers wherever you are. There are iOS and Android mobile apps for mobile access to fleet and driver data. Among the features available are live views, alerts, vehicle status, reports, and more. 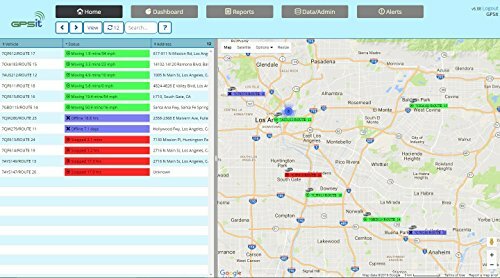 InTouch GPS lets you generate all types of fleet and driver reports, including customized reports based on your organization’s unique needs. You save time by generating all types of reports automatically, whenever you need them – daily, once a week or once a month. They are forwarded to your email or to multiple recipients based on their roles and departments. The automatic tracking helps prevent costly repairs. It sends notifications when service is coming up or when it is overdue, so you can prepare accordingly. You can create driver profiles and compare their performance, assess them based on safety, work completion and other metrics to identify issues that need to be addressed, top performers, and whether further training is needed. The company also offers a buyer’s guide, how-to guides, step-by-step video tutorials, a FAQ section, hardware and software documentation, and on-going training. The company’s customer service and tech support take calls only during business hours – 8 a.m. to 5 p.m. US Eastern time. This means that if you need help or have an emergency and are located on the West Coast, you might have to wait until the next business day. The company offers several hardware and service options, so it can be a challenge to try and figure out which combination is right for your fleet. There are also different devices and separate plans for asset tracking, such as non-vehicles. There is a one-time $20 hardware activation fee, which is a bit of a downside. Moreover, the company requires the first and the last month’s payment up front. This information is made clear right from the start, so you won’t be in for any unpleasant surprises when the bill comes. GPS TrackIt’s products are affordable, easy to use and full of amazing features. Their vast array of devices and software offer everything you need to monitor vehicles and drivers at all times and from anywhere. This company also doesn’t have a minimum-entry requirement. GPS TrackIt offers affordable, customized pricing solutions, giving you the freedom and flexibility to adjust the software and hardware to your fleet’s unique needs. You don’t have to pay for features you won’t be using. This can save you a lot of money and help you create the perfect GPS fleet-tracking software for your establishment. The company’s GPS fleet tracking software comes with a free 30-day trial, so you can test it before making any commitments. The company has iOS and Android apps with intuitive navigation and very user-friendly layouts. The apps feature simple arrows and menu tabs, making it easy to access different functions. The main features – Vehicles, Maps, Vehicle History and Geofences — are clearly labeled and highlighted for one-click access to the most relevant and frequently accessed data. The software and hardware are also easy to install. The system is equipped with plug-and-play hardware. GPS TrackIt’s mobile app comes with basic fleet and driver monitoring features. This includes the capability to keep track of vehicle conditions such as maintenance and fuel consumption, locate vehicles, and monitor driving behavior. However, the app is not limited to just these features. It incorporates both fleet management software and GPS hardware data so it is possible to operate your entire fleet straight from your mobile device. You don’t need to log in to the web or desktop version of the software to set alerts. The mobile app lets you set up all kinds of real-time notifications, including maintenance alerts and bad driving alerts, like speeding and making unauthorized personal stops. You can also set up driver arrival and departure alerts to make sure your drivers are adhering to their shifts and schedules. While many companies require you to log in if you want to manage drivers remotely, GPS TrackIt lets you contact and dispatch them, send directions, re-route vehicles, and offer your drivers assistance if they are late or need help from anywhere. This feature is also handy for providing faster response times to improve customer service. Maps are mobile optimized, so the user can view more than one map simultaneously. It is also possible to view each vehicle’s speed and the direction it is moving in on a single screen. The company uses Google Maps to reflect the most accurate locations, including satellite views and addresses. The company places no limit on the types of reports you can run or view. Whether you’re accessing driver profiles and histories, vehicle maintenance reports, event summaries or custom reports, it is possible to view them all in detail on your smartphone or tablet. Emails are sent with a single click. The company’s cloud-based GPS fleet-tracking app allows you to sync data and any changes made across all devices and users in real time. Whether you’re on a tablet, computer, or smartphone, you’ll always have access to the most current information. You get access to all of your data right from the get-go. The company holds data permanently, so you always have a record of everything going on with your fleet. GPS TrackIt’s customer service can be reached by phone using a toll-free number, email, or live chat via the company’s website. You can also connect with them on social media. The staff are friendly and helpful. The company’s website also has an FAQ page, a blog, a collection of resource articles and free demo videos. On the downside, GPS TrackIt requires a long-term contract. You can choose a one-, two- or three-year contract, and there is no fee if you decide to terminate early. Limited customer-support hours are an additional drawback. There is 24/7 support by email, but you won’t always be able to contact a real person if you need immediate help outside of business hours. Third Choice : Advanced Tracking Technologies, Inc.
With ATT’s vehicle tracking devices, you have the ability to closely monitor driver behavior and find ways to improve fleet efficiency. The company’s sophisticated software lets you set up automated alerts to track speeding and idling. Tracking vehicle usage, reducing negative driving behaviors and optimizing driver routes can help minimize fuel costs. ATT’s products enable fleet operators to adjust routes to reduce driving time, thereby enabling fleets to run more efficiently and drivers to focus on providing better client services. The GPS tracking software helps companies across the United States to manage mobile assets more efficiently and limit fleet operating costs. Drivers are kept accountable during the workday by maintaining accurate driving records. Users of ATT’s software receive updates every 10 seconds, thereby being afforded the opportunity to monitor employee activity throughout the day. More accurate accounts of hours worked are possible thanks to the digital timesheets. GPS tracking isn’t just for truck fleets; it can be used for tracking mobile assets as well, including heavy equipment, boats, bulk containers and more. The GPS software provides location information for enhanced security and accuracy when you can’t ensure someone will be on site to monitor your assets. The company does not offer any representation outside of Texas. TSO Fleet Pro is a mobile app offering a new and innovative way of accessing fleet data and tracking it while on the road. The app features a list of all your vehicles, and you can select the units you want to track. The map offers three views – street, satellite and hybrid – in real time. Click on a vehicle’s icon and get instant access to the most current information on that vehicle. TSO Fleet Pro is made for Apple users who want to track their fleets on the go and pull up a detailed history of fleet activity. It is easy to view historical locations on the map – just choose a data range. Multiple vehicle selection in the Units list is possible. The Sensors system features a history, filters, and notifications. You can chat and send messages through Garmin devices, manage work orders, control your units remotely, and access all your fleet’s location information from your smartphone. The app lets you maximize productivity, optimize scheduling and routes, save money on fuel costs, monitor fuel usage, lock and unlock your vehicles remotely, and improve drivers’ communication. All this will culminate in a higher turnover and increased profits. The company requires that you have a contract with them to use the app, i.e. you need to be an existing customer of TSO. Fleet managers can control their workforce on the go with this app, available in both Android and iOS. This unique technology provides insight into where your fleet and other assets are and their activity and state, and easy, cost effective communication with your mobile workforce is a given. Whether the fleet manager is in the office or on the road, Teletrac provides them with the fleet intelligence they need to track and manage the whole fleet. Real-time location tracking to find a vehicle or asset anywhere, anytime is possible. A simple query will suffice to get instant statistics about a certain vehicle’s status. The maps accessible with this app are integrated with Google’s standard or satellite maps. Fleet operators can send messages to make communication with one or multiple vehicle operators easier. Finally, the routing feature lets you send a destination address with navigation instructions to a driver with turn-by-turn directions instantly. There have been complaints about having to wait too long for customer service, in some cases over a week. The company has apologized and given assurance that they are working to employ and train more staff. MyCarTracks makes having your own fleet tracking solution easy and affordable. This mobile app enables you to track your staff, vehicles, drivers, routes and destinations. It has been downloaded more than 80,000 times, and currently has tens of thousands of active users. The Auto Start feature helps you save your battery. Just start the app and it will record your tracks for the entire day. You don’t need to install a separate GPS unit to your vehicles. Your Android smartphone can replace this. You can get amazing reports and view your fleet’s location on a map. The cloud saves all of your data. The app also makes it possible to watch the fleet run in real time. This way you can dispatch the closest vehicle to the client in no time. The app is free. You can get up to 15 days of data history for up to three vehicles and several monthly reports for free as well. For $7 per vehicle per month, you get unlimited data history storage, reports and vehicles and API access. You need to keep your phone in a visible place, ideally near the front window. Alternatively, you would need to get a phone with an optimal GPS module to get better tracking results. One crucial aspect of GSP fleet tracking is asset monitoring. Maintaining control of significant assets is perhaps the most important part of managing a business fleet. This includes not only the vehicles, but the cargo and other equipment as well. GPS fleet tracking can afford a constantly updated position for every item and reveal when a stationary object starts moving. This way, a fleet operator can detect theft immediately and take action to avert the loss. Many insurance providers offer lower rates to fleet operators who install GPS tracking, which reflects its value in protecting these assets.